In the fast-paced, high acuity environment of our Intensive Care Unit, clinicians make life and death decisions every day. With a focus on saving lives and sustaining a quality of life, clinicians rarely have a moment to reflect when a life ends. As the unit that cares for the sickest adult patients in Mount Sinai Hospital, the inter-disciplinary clinical team provides end-of-life care to a large number of patients annually. Dr. Sangeeta (Geeta) Mehta, a Critical Care physician and researcher who has worked in the ICU for more than 20 years, felt that for the benefit of the patient’s families and for the clinical team who provide such committed care to patients, there should be a better way to embed a reflective moment into their practice. “Our team is so focused every minute on providing care to the living, I felt that a moment to help both the family and our team at the moment of loss was important. If you don’t formalize it, it’s unlikely to happen because we’re so busy” explains Dr. Mehta. With Reverend Nola Crewe, a member of Sinai Health System’s Chaplaincy Services and an integral part of the ICU team, they developed a program that brought together the entire clinical team in the moments after a death has been declared. 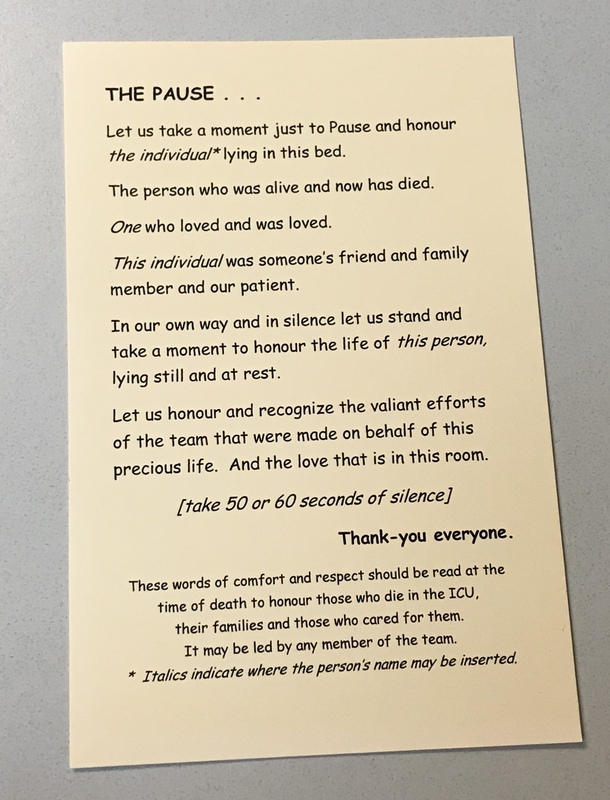 Physicians, nurses, RTs, physiotherapists, trainees, social work and others who were involved in the patient’s care join family members in the room and gather around the patient’s bed to read “The Pause”, followed by a reflective minute to honour the life of the patient as well as the efforts of the clinical team. The team will read “The Pause” even if family members are not present. While Reverend Crewe usually leads The Pause, she encourages other ICU team members to lead it in her absence. “Really, anyone can lead this moment – a physician, nurse, social worker or anyone on the ICU care team,” says Reverend Crewe. “I am often with families in the moments that their loved one has died and after the machines are turned off, and the room is quiet, they tell me that they really don’t know what to do next. After many emotional weeks in the ICU, I believe that this reflection helps them begin their grieving process in a supportive and meaningful way.” Reverend Crewe also leads a service every year for families of patients who have died in our ICU.